The Gaslamp Quarter is a historical neighborhood in downtown San Diego, extending from Broadway to Harbor Drive and Fourth to Sixth avenues. It’s named for the Victorian-era gas lamps that once lined the streets. The area is listed on the National Register of Historic Places and includes 94 historic buildings, most dating back to the 19th century. The neighborhood is an entertainment destination, encompassing more than 200 restaurants, cafes, bars and nightclubs and more than a hundred shops and boutiques. The five-level, outdoor Westfield Horton Plaza shopping mall features bright colors and a postmodern style that borrows heavily from Art Deco designs and motifs. Visitors can choose from among 20 upscale and boutique hotels in the area. Downtown is the hub of San Diego's government, legal and banking industries. As a visitor and local destination, the Gaslamp Quarter also includes a large number of restaurants, bars, nightclubs, hotels and shops. The retail market in downtown San Diego, and particularly the Gaslamp Quarter, is on the rebound. Real estate brokers saw a significant acceleration in downtown retail leasing in the first half of 2013, following more than two years of slow to flat growth. The Gaslamp Quarter is one of San Diego’s most well-known neighborhoods among locals and visitors. The 16 1/2 blocks that make up the district includes more than 200 restaurants, cafes, bars and nightclubs, more than a hundred shops and boutiques, theaters, art galleries and a mall. 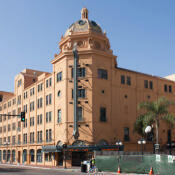 The historical district is home to more historic commercial buildings than any other neighborhood in San Diego. From its somewhat sordid beginning to its renaissance in the 1980s and ‘90s, the Gaslamp has been successfully reinvented as an entertainment, dining and shopping destination.